Sting.com > News > LAST FEW TICKETS! 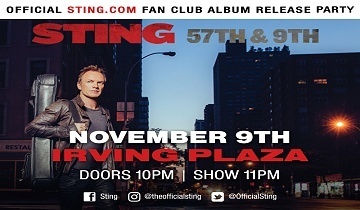 - Sting.com Fan Club 57th & 9th Album Release Party Announced - November 9 at Irving Plaza in NYC! LAST FEW TICKETS! - Sting.com Fan Club 57th & 9th Album Release Party Announced - November 9 at Irving Plaza in NYC! Following the recently announced 57th & 9th iHeartRadio Album Release Party on AT&T, we are excited to share the news that Sting will perform a SECOND concert for Sting.com Fan Club members at Irving Plaza next Wednesday, November 9 at 11PM ET! This special show at the iconic venue will celebrate the release of his new rock/pop album, 57th & 9th, out Friday, November 11, and every ticket purchased online will include a digital download of the new album. For this show, he will be joined by a 5-piece band including Dominic Miller (guitar), Vinnie Colaiuta (drums) and Rufus Miller (guitar), with backing vocals by Diego Navaira and Jerry Fuentes of The Last Bandoleros. The perks of a Sting.com Fan Club membership include early ticket pre-sale access for tour dates, exclusive invitations to performances and TV tapings, behind-the-scenes video and photos from the road, signed memorabilia giveaways, and much more! If you’re not already a member, consider joining the Sting.com Fan Club today for the opportunity to purchase tickets to this show. Tickets are will go on sale Monday, November 7 at 3PM ET for Legacy Fan Club members and at 4PM ET for new members. Please note, as the capacity at Irving Plaza is extremely limited, there is a limit of two (2) tickets per purchaser across both the iHeartRadio show and this Fan Club show. Tickets may be purchased for $90 via Ticketmaster or in person at the Irving Plaza Box Office. For questions, contact the Irving Plaza Box Office at (212) 777-6800. Fan of Stephen Colbert? In New York on Thursday? Hey Sting.com members. Are you a fan of Stephen Colbert? Are you going to be in New York on Thursday afternoon? If so, please leave a comment and let us know… you never know what might come of it. Sting: Who are you calling an ageing rock star?